"With its own army, Europe could react more credibly to the threat to peace in a member state or in a neighboring state"
"The Common Security and Defence Policy shall include the progressive framing of a common Union defence policy. This will lead to a common defence, when the European Council, acting unanimously, so decides. It shall in that case recommend to the member states the adoption of such a decision in accordance with their respective constitutional requirements." "If a Member State is a victim of armed aggression on its territory, the other member states shall have towards it an obligation of aid and assistance by all means in their power, in accordance with Article 51 of the United Nations Charter. This shall not prejudice the specific character of the security and defence policy of certain Member States." These components of the existing treaty could very well become the core of a more Eurocentric alliance in the event that NATO lapsed or dissolved following a US withdrawal from its structures. With the mutual defence clause and a broad statement, committing the members to creating "a common defence", that could be interpreted in many ways the EU has the tools to create a defence union. While the prospect of achieving the unanimous support of the Council of Ministers (i.e. the governments of the EU member states) for such a policy currently seems remote, the US pulling out of NATO could very well provide the impetus for a significant policy shift amongst many of the states currently reluctant to pursue the idea. If the decision was made to develop the EU, rather than NATO, as the core European defence alliance this would undoubtedly have profound consequences for the long-term evolution of the EU's role and the shape of defence on the continent. However, while the groundwork may have been laid for the EU to assume a much broader and deeper role in European defence, little of substance has actually been built on those foundations. Some progress towards the goal of increased European defence integration was made in the early 2000s: the creation of the EU military committee (2000), EU Institute for Strategic Studies (2002). 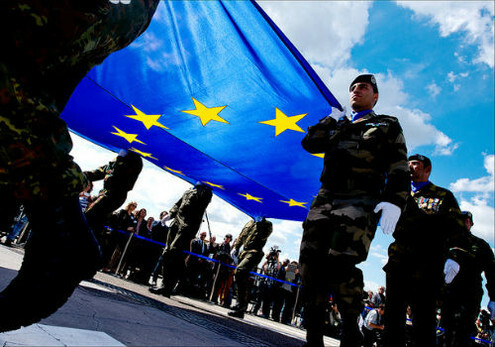 a European Security Strategy (2003) and the establishment of the European Defence Agency (2004), an EU Military Staff (2004) and EU Battlegroups (2007). While this may seem like an impressive timeline, tracking the progress of an increasingly mature European Union defence identity, a brief look at "the man behind the curtain" reveals just how hollow these structures really are. In reality the whole EU defence project to date amounts to little more than an organisation playing with a handful of feeble military instruments. Take for example the EU Battlegroups that were heralded by Eurosceptics as the beginning of the end of their national armed forces, and by Federalists as a key step on the road towards a fully-fledged EU armed forces at the core of an increasingly state-like union. To date neither of those predictions have come to pass although, admittedly it is likely still too early to tell where the end point will be. However, what we currently have are a handful of toothless regiment-sized "rapid reaction" forces theoretically capable of deploying within 5-10 days and sustaining themselves for about a month, this can be extended to 120 days "if resupplied appropriately". When you consider that the combat capabilities of these formations are, frankly, pathetic it is unsurprising that deploying them remains politically impossible and that none have ever been used. The only conclusion that can be made about the EU Battlegroups is that their purpose is as a symbolic political project, rather than a serious attempt to create an EU military that is at all credible. EU Battlegroups: small, toothless and nearly impossible to deploy. If the EU Battlegroups are currently the apex of the European Union's defence identity, then it is clear that if the organisation would have a very long way to go if it was to take on the expansive defence and security role currently provided for by NATO. One way of achieving this on a much shorter timescale would be for the EU to "adopt" the, now highly Eurocentric, NATO alliance following American withdrawal. This would have the very significant advantage of not having to build 70 years of military experience almost overnight, along with the continuation of mature NATO structures. Such an arrangement could also provide crucial impetus to progress Turkey's application for entry into the EU. Alternatively, "Europeanisation" of the NATO alliance may lead to political tensions that could see non-EU members such as Turkey and Canada depart altogether. The continued participation and commitment of non-EU states would almost certainly be in doubt, so long as they remained outside the formal political union. Although the adoption of NATO as a "European" institution is a possibility that could be made to work, the practical difficulties in achieving this aim would seem to be quite significant. Under these circumstances it has to be asked that if NATO should lapse or fall apart, following a US withdrawal, how well placed is the EU to recreate its functions? From the perspective of institutional experience it's fair to say that the EU is extremely poorly equipped to take on NATO's principal roles of collective defence. The EU Military Staff itself remains incapable of conducting operations, instead delegating this responsibility to an "Operational Headquarters" (OHQ) drawn from an existing military alliance (such as the NATO Allied Command Operations centre) or a member state (such as the UK's Permanent Joint Headquarters in Northwood). While a parallel "EU Operations Centre" has existed since 2007 it is not a formal standing headquarters and would be assembled on an ad-hoc basis. This body's capacity to plan and conduct complex military operations, without extensive support from the member states, remains extremely limited. While a permanent standing EU operational headquarters would certainly enhance the institution's capacity to plan and conduct complex military operations, it is unclear why it would be necessary, when it would simply duplicate a capability that already exists across Europe. Currently there are headquarters in the UK, France, Germany and Italy (as well as the NATO HQ in Belgium) capable of acting in the EU OHQ role. In terms of command and control the EU remains almost wholly reliant on its members to provide the necessary facilities and personnel to coordinate complex operations. Without "adopting" the NATO OHQ, building the existing ad-hoc EU Operations Centre into a fully fledged military command and control facility would undoubtedly be a lengthy and very expensive process. Another serious issue is the EU's lack of institutional military experience. To date EU operations on land have been characterised by their relatively small scale, low-intensity and multinational nature. 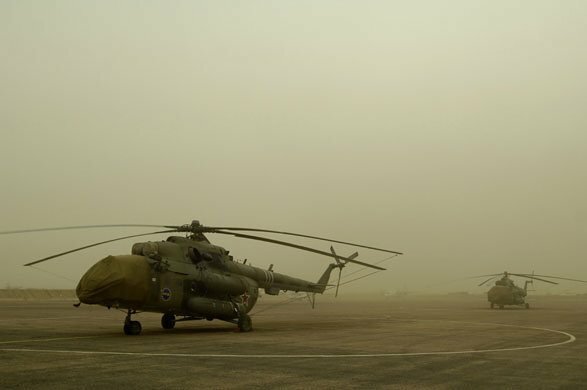 Since 2002 five ground operations have been conducted under the EU Force (EUFOR) banner in the following countries: Macedonia, Bosnia and Herzegovina, the Congo, Chad and the Central African Republic. The largest of these operations (EUFOR Chad/CAR) comprised 4,300 troops drawn from twenty nations, of which 3,700 were actually deployed and 600 held in Europe as a reserve force. More than half the troops assigned to the operation were French, with significant Irish and Polish contingents also present. This relatively modest out of area operation suffered significant logistical problems from the outset, taking six months to achieve its full in-country operating capabilities and only then with significant additional support from the French and Russian armed forces. Only with the deployment of Russian helicopters in late 2008, in support of the EU mission, were these finally overcome. during their deployment to Chad in 2008-2009. Although the EU has some institutional experience with low-intensity peacekeeping operations, such as the ones listed above, its current capacity to do much more is doubtful; considering the significant problems it appears to have had deploying small forces overseas. On the European periphery the peacekeeping missions in Bosnia and Macedonia are essentially a continuation of the NATO missions to those countries, the only things that have changed in practice are the overall commanders and the addition of the EU brand to the mission. Functionally these deployments have changed very little since their handover from NATO to the EU in 2004. Since 2008 there have been two significant EU naval operations, Atlanta and Sophia/Triton. The former was the EU's response to the spike in piracy off Somalia between 2005 and 2013 and the latter is the ongoing operation to deal with the Mediterranean refugee crisis. Operation Atlanta was part of a wider international effort, involving many other states through the multinational Combined Task Force 151. Its goals were limited and the operating environment permissive, essentially amounting to a complex maritime constabulary task far removed from high intensity war-fighting. As for the EU's Mediterranean operations, Sophia and Triton, both have (to date) failed to match the operational effects achieved during the Italian government's unilateral effort: "Operation Mare Nostrum" conducted between 2013 and 2014 but ended on cost grounds. If these missions were to be summed up with a single word it would be "unambitious". EU missions to date have been defined by their narrow scope, small scale, permissive operating environments and limited duration. This is likely indicative of the institution's structural inability to manage more ambitious or complex military tasks in its current form. So what of the prospects of deeper integration and a unified EU armed forces? It is unquestionable that mechanisms do exist within the Lisbon Treaty to facilitate increased military integration, the ultimate goal of which is a "common defence". Although the terms used in the treaty are broad and any progress requires unanimous consent from the Council of Ministers (effectively giving every state a veto) it is fair to say that structural provisions do exist to facilitate more defence integration. However, the requirement for unanimity ensures that, in practice, very little real progress can be made towards an EU defence union at present. The final report of the Future of Europe Group identified this issue in 2012, suggesting that in order for progress to be made towards defence union the principal of unanimity would have to be given up in the area of the Common Foreign and Security Policy (CFSP) and replaced by the Qualified Majority Voting system. Such a change would indeed be required if progress were to be made towards a more federated EU defence structure. That said, the prospect of member states unanimously rescinding their veto in this area currently remains a remote one. The key question therefore becomes: would a US withdrawal from NATO be a significant enough strategic shock to convince EU members to abandon the principle of unanimity on the CFSP? Of course there is some possibility that such an event might trigger a much broader reconsideration of the EU's role as a serious European defence player and there will be some within the EU institutions that would push hard for it but, in the author's opinion, there would simply be too many structural problems to overcome in order to turn the EU into a credible military player. Such a significant change in the status of the union as the movement towards a meaningful defence union would undoubtedly trigger referendums in a number of countries and these would be plebiscites that the federalist position would be unlikely to carry, given the significant unpopularity of moves towards further political integration in a number of key EU states. Not least of which is the union's foremost military power: the United Kingdom. In practice an EU defence union could not work without the wholehearted support of Britain and France, something it is unlikely to receive for domestic political reasons rather than foreign policy concerns. Even if the vast political hurdles to such an enterprise could be surmounted, they would inevitably be followed by even greater practical issues. How would an EU military be funded, raised, trained and equipped? Taking on one of the core functions of a state, defence, would inevitably lead to the growth of other federalising pressures: centralised powers of taxation foremost amongst them. This is simply one of the many reasons upon which the "EU Army" concept falls apart, to build a credible army the EU would need to become far more like a state than it currently is and there simply isn't the appetite amongst the peoples of Europe to see that idea realised. The closest that Europe has currently got to a unified military organisation, a "European Army" (albeit not an especially credible one) is Eurocorps. Established over three years between 1992 and 1995 Eurocorps is a multinational military organisation centered on a permanently attached combined Franco-German brigade. While Eurocorps is not an EU organisation it does explicitly state that its purpose is as a force that can be made available to the EU, along with other international organisations and NATO, when necessary. To date the Corps only has five permanent members: Belgium, France, Germany, Luxembourg and Spain alongside five associate states: Greece, Italy, Romania, Poland and Turkey. 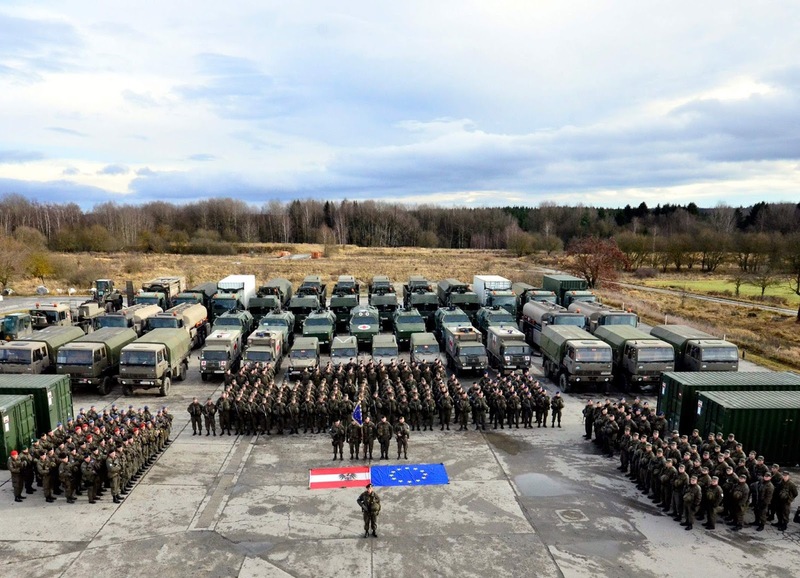 While Eurocorps may seem to be a European Army in the making to an outside observer in practice it is in fact similar in execution to NATO's multinational Response Force and Very High Readiness Joint Task Force. The principal difference being that Eurocorps can also be used for or in support of EU missions, hardly a model for a future EU armed forces. 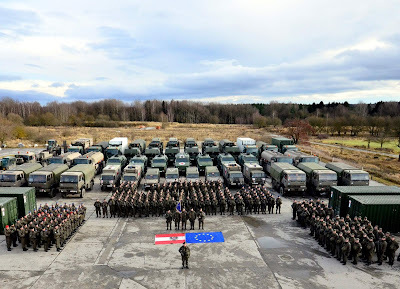 Eurocorps, a very long way from a real "EU Army"
The final assessment of the EU's ability to assume NATO's role of collective defence, in the event that the alliance lapsed or dissolved following American withdrawal, is that in all likelihood it could not. The EU's existing military structures are, in all honesty, pathetically feeble and principally symbolic. They are the follies of an almost exhausted federalist dream rather than a serious attempt at building a set of armed forces for the EU that could perform the roles currently covered by the member states themselves and coordinated through NATO. Although NATO could be "adopted" as an increasingly European institution, following US withdrawal, this would have the likely effect of driving a wedge between EU NATO members and non-EU members. A wedge that could potentially lead to the withdrawal of allies, such as Turkey and Canada, from European defence structures entirely. Furthermore, the political difficulties inherent in setting in motion the processes which would enable the creation of a European Army remain so great as to be almost insurmountable. They are tied far too closely to an unpopular federalist direction for the EU to gain the support needed to carry the creation of a single military force for the union through to its conclusion. The, almost certain, outcome would be a series of unwinnable national referendums on the issue, which would undoubtedly kill it. The reality of the EU's military structures is that they are a "Potemkin Village", a symbolic facade with no real substance behind them. They cannot be relied upon to provide for Europe's defence because they are incapable of managing all but the simplest and lowest intensity conventional operations. In effect the institution would remain wholly dependent on its members and unified EU armed forces will remain an unattainable federalist dream.